Is the Universe already dead ? Posted on December 29, 2008 under Rants. Was browsing through Photos at The Big picture from the Hubble telescope (like the one above from the site), reading through the descriptions that went with the photos. I noticed an odd thing , most of these photos are of celestial bodies thousands if not millions of light years away. 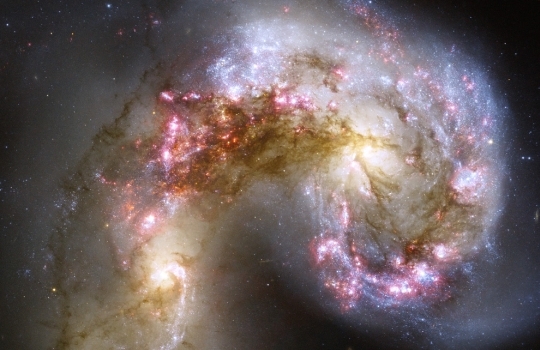 (The Antennae Galaxies shown here are 55 million light-years away). Now if my understanding of light years is correct, the light that we see today left that galaxy (say the antennae galaxy) approximately 55 million years ago. That is to say that 55 million years have elapsed since the light radiated and reached us, and needless to say a lot might have transpired since then. Now the width of the known universe is estimated to be 156 billion light years across, and the age of the earth about 4.5 billion years. So to put things in perspective light from that end of the universe would take say a few more billion years to even reach us (if at all). So that brings us to the question, what if the universe already started “dying”, would we be dead and long gone along with it before we could ever see any sign of it ? This entry was tagged under: Rants. Both comments and pings are currently closed. Thanks for blogging about our campaign to rescue Olive Ridley turtles’ habitat from destruction by the Tata’s Dhamra port. We’ll be needing your help to do that. Could you please email me? Will let you know whats happening, what we’re planning to do and how you can help.